It was the dark of the moon on the sixth of June in a Toyota with no fumes. Add a Nikola Tre with a reefer on and a Hyundai haulin’ hogs. Wait a minute... no fumes? In 2016, medium and heavy-duty trucks accounted for 23% of transportation-related greenhouse gas emissions in the United States. That’s more emissions than trains, planes, ships, and light trucks. Only passenger cars accounted for more. In fact, the transportation sector here in the U.S. made up nearly 30% of GHG emissions that year. So when you take a look at the Toyota-built semi below, there’s no way you’d think the only emissions it was producing was pure water vapor. Last spring, this 80,000-pound beast with 670 horsepower and 1,325 lb-ft of torque drove for 10,000 miles, hauling cargo out of Los Angeles and Long Beach in Toyota’s first test using a truck powered by hydrogen fuel cells. Of course, out of the 16,000-odd commercial trucks operating in this test area, only Toyota’s was emitting ZERO pollutants into the air. 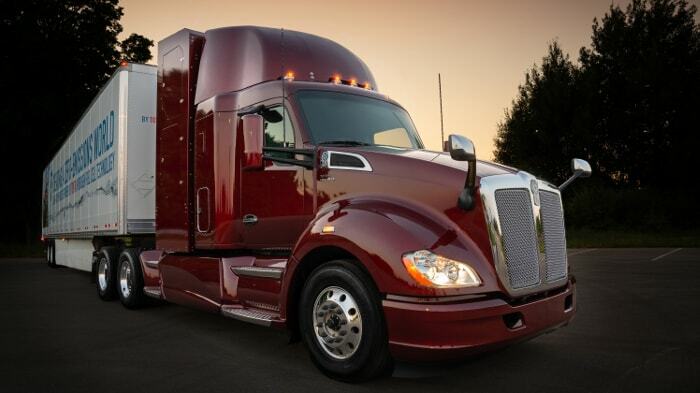 Dubbed “Project Portal,” this silent semi was tested for more than a year between distribution centers across the U.S. and had a range of around 200 miles. And thanks to the success of the project, Toyota decided to move forward and has already put its next hydrogen-powered truck into the mix. This new truck had the same power and weight as the first, but it could roll 300 miles before fill-ups. Oh, don’t think Toyota is alone in the early stages of this fuel cell boom. Over in Europe, the Nikola Tre can go up to 745 miles on one tank and is the first European zero-emission commercial truck. And Nikola Motor Company plans on building out the necessary infrastructure to support its future fleet of hydrogen trucks. In Switzerland, Hyundai announced plans to deploy 1,000 fuel cell commercial trucks, with the first trucks rolling in as early as next year. These hydrogen-powered semis have a range of around 250 miles, thanks to eight giant hydrogen tanks onboard. That’s not to mention the fact that you can fuel one of these suckers up faster than your car at home. Mercy sakes alive, looks like we’ve got us a global hydrogen convoy. And believe me, the market for hydrogen fuel cells is about to get big... very big. We’ve talked about this boom for months, and I told you back in September that the growth taking place is nothing short of jaw dropping. The global fuel cell market is expected to be worth $24.81 billion by 2025! Slowly but surely, the major players are getting involved. Coca-Cola, Walmart, and several other big manufacturers are getting more interested in using fuel cells to meet their energy demands. Toyota itself isn’t exactly a small company by any means, boasting a market cap of over $166 billion. To put that into perspective, that’s three times larger than General Motors, which is the largest auto company here in the United States. Forget about that — Toyota is bigger than the THREE largest U.S. car companies: GM, Ford, and Fiat Chrysler. But what if I told you there’s an even bigger fuel cell opportunity out there, and so far it’s flown under the radar of the largest investment firms on Wall Street... and it’s trading for under $5 a share? So what’s the catch? What would possibly make you want to look past Toyota in this $25 billion fuel cell boom? This company isn’t your typical small cap. Word leaked over the summer that it had penetrated the world’s largest market for electric vehicles and was forced to revise its revenue estimates after making the news public. I’ve put everything you need to know about this tiny fuel cell stock in my latest investment report, which you have exclusive access to as a member of our Energy and Capital investment community. Yeah, we got a little ole hydrogen convoy — ain’t it a beautiful sight? Oil might be down, but natural gas is cooking. In fact, it's up 35% in the last two months, and there's more where that came from. Energy and Capital editor Christian DeHaemer lays out the perfect trade.